So last weekend, I decided to set aside a few hours and watch it. There were a few reasons for the timing: one, the winner of this year’s Lifetime Achievement Award, to be presented at the 2018 SuperShow coming up in July, is Sensei Fumio Demura. Demura was not only the stunt double for Pat Morita (“Mr. Miyagi”), but helped inspire Morita’s portrayal of the character. Demura was always an incredible martial artist in his own right, and with The Karate Kid, he helped spur an entire generation of students to enroll in martial arts. I wanted to see what kind of film could have that powerful an impact on our industry. My second reason was YouTube’s release this May of its Cobra Kai series, which follows the lives of the main protagonist and antagonist of The Karate Kid some 30 years after the events of the movie. My coworkers all seem to be watching it, and they keep making Karate Kid references around me. There are only so many times I can laugh awkwardly and say, “Wax on, wax off,” before they figure out that I don’t know what’s going on. Well, I’ve seen it now, guys! Reference away! 1. Wow, this kid is way less excited about moving to California than I would be. 2. Wait he’s literally having to push the car to get it to run, then jump in as it’s driving away? Maybe he’s less upset about the move and more worried about the prospect of driving across the country in what is clearly a death-trap of a vehicle. 3. Freddy seems nice. But Danny just met him and he’s going off to a party with him the next day? This is how you get murdered, Danny. 4. Okay, a party at a public beach is probably pretty safe. But he’s been out there all day, from morning until past dark. Hasn’t his mom wondered where he is? He doesn’t even have a cell phone to check in with! What if he had been kidnapped? I bet a lot of children got kidnapped in the 80s. 5. Oh, people on motorcycles! I bet these are the bad guys! 6. So Johnny is Ali’s ex? And he shows up out of nowhere, beats up another boy in a fit of jealousy, and destroys her radio in an attempt to win her back? Those are some major abusive behavior red flags. I feel like Ali’s the one who needs to learn martial arts, TBH. 7. Danny won’t take off his sunglasses and his mom asks, “Are you on something?” They’ve been in California less than 48 hours and she’s already suspicious. 9. Miyagi is judging your book-and-two-weeks-at-the-Y karate style so hard, Danny. 10. HOLY MOLY okay so now Johnny and his crew rode Danny and his bike off the road with their motorcycles? Is that attempted vehicular homicide? JUST GO TO THE COPS, DANNY. 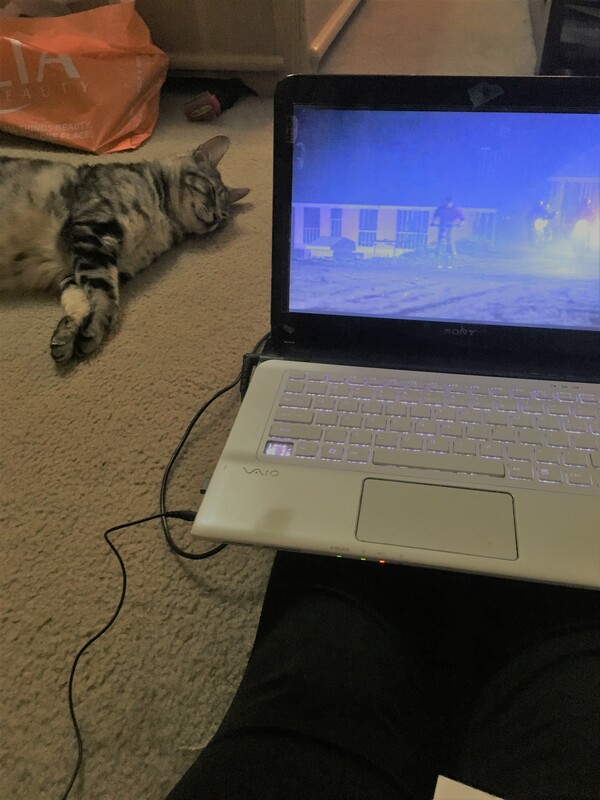 Behold my super-sweet home entertainment system: a 6-year old laptop (minus one Control key), paired with earbuds ($15, Walgreens) and a cat (free, family friend). Gizmo was not nearly as concerned for Danny's well-being as I was. 12. I’m 30 minutes into the movie and Danny still hasn’t learned karate. Should I be concerned? 13. That is the best Halloween costume ever! I want to see the scenes where A) Miyagi makes the costume, and B) forces Danny to wear it. 14. Oh dear. I can see this Halloween dance not ending well, and –what are you doing, Danny? Danny this plan is going to backfire massively. Why is there even a hose in the bathroom, anyway?? 15. I told you so, Danny. Now you’ve caused a four-car pileup and these guys are probably going to kill you. 16. OH HEY THIS IS ONE OF THE SCENES FUMIO DEMURA DID THE STUNTS IN! I know this because earlier this weekend, I watched a documentary on Demura’s life: “The Real Mr. Miyagi.” Great film. I recommend it. 17. Miyagi is a master of karate and sass! 18. You know…the Cobra Kai Dojo doesn’t seem so bad. Sure, it’s intense, but it’s really well-organized and Kreese is a solid instructor. A bit militaristic, perhaps, but effective. 20. *I’m pretty sure that was the exact line. 21. Hey, Mr. M just said the “Wax on, wax off” line! It was…literally referring to wax? I’ve always assumed that that was metaphorical. Or, like, a reference to the moon waxing and waning? I don’t know don’t judge me! 22. Ali and Danny are going on a date with his mom as a chaperone! How quaint! 23. Poor Danny’s getting tired of doing yardwork – also wow, there is a lot of swearing in this movie. 24. Woohoo, now we’re getting to the real training! 25. Ali’s parents are kind of terrible! Not only are they judging Daniel for not having their kind of money, they’re forcing their daughter to dance with her (psycho!) ex-boyfriend. Bad parents! Bad! 26. So Johnny’s being super creepy-kissy towards Ali just to aggravate Daniel? Socio. Path. 28. Did Miyagi just give him a sake shot? 29. Oh wow, he is drunk. I feel like kids’ movies got away with a lot more back in the day. 32. Oh. Oh no. :( And he still has his dog tags. My heart was not ready. 33. Our boy Daniel is training solo! 34. Aw, this birthday scene is so cute. ^_^ Wait, so that gi would have been for Miyagi’s son. Now I’m sad again. 35. "You’re the best friend I’ve ever had.” I am literally going to cry now. 38. Hmph! Why is that Cobra Kai kid calling Daniel “Danielle” as an insult? I know some really great people named Danielle! 39. OMG IS THAT REF PAT JOHNSON? 41. Haha, I thought so! Totally Pat Johnson. Another great guy. He taught Pat Morita karate for this movie. 42. Why do they say “En guarde” before all the matches? When did French come into this? 43. You can tell the Cobra Kai team is tough because none of them have sleeves. The shorter the sleeves, the tougher the dude. I bet that’s why a lot of guys at the gym these days wear tank tops with sleeves that have receded so far, they literally just have gaping holes in the sides. So tough. 44. Pat Johnson just announced Daniel’s first victory over one of the Cobras! 45. Kreese looks like a thicker, angrier version of Harrison Ford with a chin dent. I am not wrong about this. 46. So Daniel’s out?? And why are there no rules to prevent one team from doing this? I feel like there should be, otherwise schools with more students have a better chance of winning because they can just foul their way to the top. That seems unfair. 47. Alright, Daniel’s going to keep fighting! 48. OH SWEET MERCY A KNEE IS NOT SUPPOSED TO BEND THAT WAY. 49. WHY IS THAT NOT AN INSTANT DQ FOR JOHNNY? 51. Ha-HA! I don’t care if my coworker told me that Daniel won with an illegal kick (spoilers, Jordan, geez! ), you deserved that face kick, Johnny, you absolute creep. Also, was it even that illegal? This tournament’s rules seem pretty arbitrary. 52. Morita should have won the Academy Award for Best Supporting Actor for this. I assumed that I would like Karate Kid from the get-go, but I ended up loving it. I see why so many kids in 1984 went from the theater to the nearest dojo to ask for lessons (also probably they were worried about getting kidnapped at beach parties). I do think it’s funny that the one dojo the movie actually showed was the antagonists’, but I’m sure that when kids came in for lessons in real life, they found far more Miyagis than Kreeses. Speaking of that -- there is one serious question I have about the Cobra Kai show. From what I can tell, the new series makes Johnny out to be if not a protagonist, at least a sympathetic character. My problem is, I don’t think the Johnny from Karate Kid was meant to be redeemable. Kreese gets a bad rap, sure. Even Miyagi says that “There are no bad students, only bad teachers,” implying that Johnny’s behavior can be traced back to a source outside himself. That’s awfully generous of Miyagi, but I think he’s giving Kreese way too much credit. But not Johnny. Johnny is volatile, his actions casually destructive. What’s his next move going to be? Break a radio? Ram a bicyclist off an incline? Beat a 15-year-old into unconsciousness? Kiss an unwilling girl in a display of possessiveness? You just never know, do ya? Johnny also has an element of finesse I think a character like Kreese would be incapable of. Despite only being in high school, he’s a skilled manipulator (or Ali’s parents are completely trash, and only want their daughter to reconcile with him for the fact that he is, presumably, from a wealthy background). But why else would he hesitate to follow Kreese’s order to disable Daniel? He’s shown that he doesn’t care about hurting Daniel on a lonely road or in a back lot. The only difference is the setting. Johnny doesn’t want the tournament crowd to see him play dirty. It’s not Daniel he’s worried about – it’s his image. And after he loses, he passes Daniel the tournament prize because what else can he do? It’s a lot harder to play the role of charming, popular karate student if several hundred people watch you bash your opponent’s head in with a trophy. TL; DR: Johnny is trash and the next person who says "Danny was the real villain in Karate Kid!" can fight me. Maybe I’m projecting too much. At any rate, I don’t see a logical path for how Johnny’s character evolves from what he was in Karate Kid to what the writers of Cobra Kai are attempting to portray him as in the new series. I’ll probably end up watching Cobra Kai to find out for myself. The series does look pretty good. Until then – wax off!